I’ve been busy preparing pages for Superstition, the board book I’m assembling for Group 6 of BookArtObject, Edition 4. You don’t suppose I could be asking for trouble, do you, embedding 15 broken mirrors into board book pages? I think (I hope) that so many broken mirrors would cancel each other out. You need to ensure that it is an odd number (as opposed to an even number) of mirrors you break though. I think. That’s good. It’s an edition of 15. Sounds interesting Ellen and I look forward to seeing the final book! Just be careful, mind you don’t cut yourself! 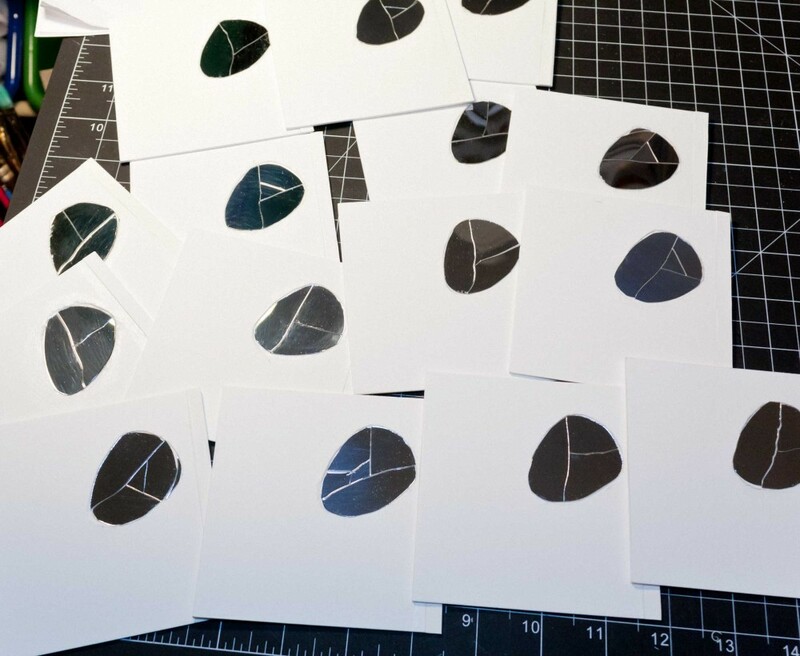 Hard to tell from the photo that those are broken mirror bits — I thought they were drawings or bits of paper. Look forward to seeing the finished book. Thanks everyone! I guess I should have explained more about the mirrors. It’s a plastic craft material that can be cut with scissors and isn’t sharp.